If you live in a place with variable seasons, bike commuting can be a bit of a problem when the weather turns cold or wet. Most people who choose not to own a car solve this problem by using mass transit when riding a bike isn’t practical. Designer Chiyu Chen has dreamed up a transit system that would let you bike when the weather is nice, earn credits for other methods of transportation, and use those credits when needed. 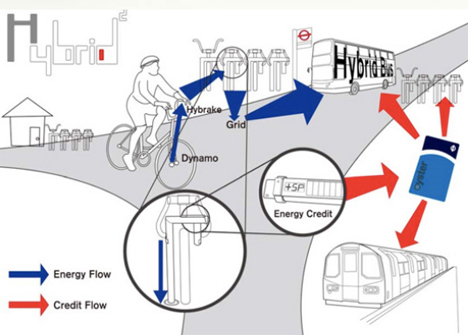 The system, called Hybrid, essentially uses electricity created from riders of rental bikes to power public buses. Public rental bikes are already available in some cities, and Chen’s idea would be able to retrofit on those bikes already in use. 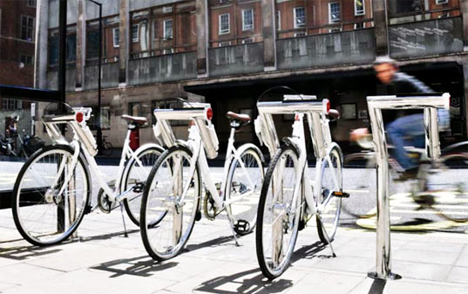 When the bikes are used, they would generate electricity that is then stored in the bike until the bike is returned to its station. After it’s returned, plugged in and locked up, the energy credits accumulated are added onto the user’s personal ID card. The bike depot is hooked up to the city’s smart grid, and the bike-generated eco-friendly electricity is stored for future use. The next time the user needs to take the city bus (which is an electric hybrid, of course), they can use the stored energy credits on their ID card to pay for the ride. In the end, this seems like a very smart system: the user gets a healthy dose of exercise on the way to and from work, clean energy is generated, emissions are lowered, and every rider gets a tangible incentive to use multiple types of public transport. It’s just a concept at this point, but with public rental bikes gaining popularity in cities around the world, it seems entirely possible. See more in Mass Transit or under Transportation. November, 2009.